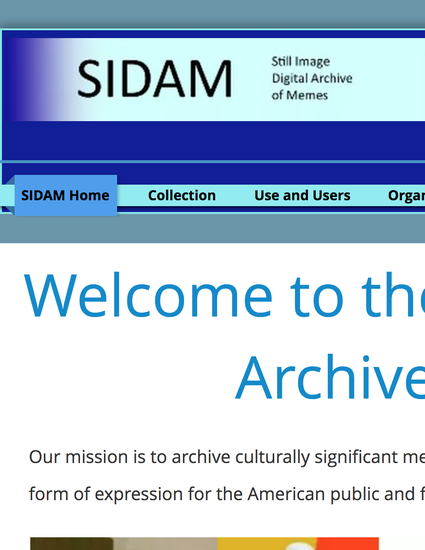 Project Description: The Still Image Digital Archive of Memes (SIDAM) aims to preserve and provide access to one of the most culturally significant user creations on the Internet. Still image memes, by our definition, are inherently digital images that comment on a variety of cultural and historical occurrences and are shaped by the memory and experiences of the American collective. Such images may not seem particularly significant, compared to editorial works and professional photography of major events, but the significance of these images lies in the fact that they are almost always user generated and are spread globally exclusively by use of the Internet. Given the democratic state of our nation, a collection of user-created images not only solidifies our belief in free speech, but also ensures that such documents are accessible for future generations, forming a national narrative directly by the people for the people.